In combination vehicles, the braking system has parts to control the trailer brakes, in addition to the parts described in Section 5. These parts are described below. The trailer hand valve (also called the “trolley valve” or “Johnson bar”) works the trailer brakes. The trailer hand valve should be used only to test the trailer brakes. Do not use it in driving because of the danger of making the trailer skid. The foot brake sends air to all the brakes on the vehicle (including the trailer(s). There is much less danger of causing a skid or jackknife when using just the foot brake. Never use the hand valve for parking because all the air might leak out, unlocking the brakes (in trailers that do not have spring brakes.) Always use the parking brakes when parking. If the trailer does not have spring brakes, use wheel chocks to keep the trailer from moving. The trailer air supply control on newer vehicles is a red 8-sided knob used to control the tractor protection valve. Push it in to supply the trailer with air, and pull it out to shut the air off and put on the trailer emergency brakes. The valve will pop out, thus closing the tractor protection valve, when the air pressure drops into the range 20 to 45 psi. Tractor protection valve controls or “emergency” valves on older vehicles may not operate automatically. There may be a lever rather than a knob. The “normal” position is used for pulling a trailer. The “emergency” position is used to shut the air off and put on the trailer emergency brakes. Every combination vehicle has two air lines: the service line and the emergency line. They run between each vehicle (tractor to trailer, trailer to dolly, dolly to second trailer, etc.). The service line (also called the “control line” or “signal line”) carries air controlled by the foot brake or the trailer hand brake. Depending on how hard you press the foot brake or hand valve, the pressure in the service line will similarly change. The service line is connected to relay valves. These valves allow the trailer brakes to be applied more quickly than would otherwise be possible. A question may come up about the proper use of the trailer hand valve (trolley valve). Remember, the trailer hand valve should never be used when driving and should only be used to test the trailer service brakes. Remember: The tractor protection valve, which controls the trailer emergency brakes will will pop out when air pressure drops between 20 and 45 psi. The tractor protection valve is designed to activate the trailer emergency brakes before activating the tractor emergency brakes when air pressure drops too low. It is very important you understand what the service line does in an air brake system. The service line controls the "regular" brakes when you use the brake pedal. Make sure you fully understand the explanation below. 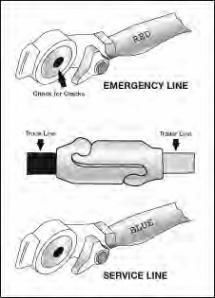 Just as important as the service line you should fully understand the below explanation of how the emergency line works on an air brake system. When the tractor protection valve closes, the red "emergency brake" valve in the cab of the truck will pop out. This will stop any air from flowing out of the tractor and into the trailer. That way, if there is a major air leak leading to air pressure loss in the system, the trailer brakes will activate before the tractor brakes, helping you keep some control of the vehicle. What is the usual color for the Service Line? Again, these are not actual regulations so colors may vary from truck to truck, but these colors have become the industry norm. What is the Trailer Hand Valve used for? The trailer hand valve (also called the "trolley valve" or "Johnson bar") works the trailer brakes. The trailer hand valve should be used only to test the trailer brakes. Do not use it in driving because of the danger of making the trailer skid. The foot brake sends air to all the brakes on the vehicle (including the trailer(s'). There is much less danger of causing a skid or jackknife when using just the foot brake. 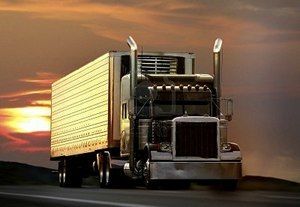 Many trucks no longer come with a trailer hand valve, but if your truck has one, you should use it only for testing the trailer service brakes and nothing more. On newer vehicles, what controls the trailer air supply? The trailer air supply control on newer vehicles is a red 8-sided knob used to control the tractor protection valve. Push it in to supply the trailer with air, and pull it out to shut the air off and put on the trailer emergency brakes. The valve will pop out, thus closing the tractor protection valve, when the air pressure drops into the range 20 to 45 psi. Tractor protection valve controls or "emergency" valves on older vehicles may not operate automatically. There may be a lever rather than a knob. The "normal" position is used for pulling a trailer. The "emergency" position is used to shut the air off and put on the trailer emergency brakes. What is the Trailer Hand Valve? The tractor protection valve keeps air in the tractor or truck should the trailer break away or develop a bad leak. The tractor protection valve is controlled by the "trailer air supply" control valve in the cab. The control valve allows you to open and shut the tractor protection valve. The tractor protection valve will close automatically if air pressure is low (in the range of 20 to 45 psi). When the tractor protection valve closes, it stops any air from going out of the tractor. It also lets the air out of the trailer emergency line. This causes the trailer emergency brakes to come on. What does the Service Air Line do? The service line (also called the "control line" or "signal line") carries air controlled by the foot brake or the trailer hand brake. Depending on how hard you press the foot brake or hand valve, the pressure in the service line will similarly change. The service line is connected to relay valves. These valves allow the trailer brakes to be applied more quickly than would otherwise be possible. Be sure you understand the difference between the Service Air Line and the Emergency Air Line. The Service Air Line controls the service brakes when you use the brake pedal. The Emergency Air Line supplies air to the trailer air tanks and the emergency brakes. What is the usual color for the Emergency Line? While the emergency line will almost always be red, the color is not a regulation so some trucks may use other colors. What does the Trailer Air Supply Control do? The trailer air supply control valve will pop out, thus closing the tractor protection valve, in what air pressure range? Which of the following statements about the Emergency Air Line is false? (2) to control the emergency brakes on combination vehicles. Loss of air pressure in the emergency line causes the trailer emergency brakes to come on. The pressure loss could be caused by a trailer breaking loose, thus tearing apart the emergency air hose. Or it could be caused by a hose, metal tubing or other part that breaks, letting the air out. When the emergency line loses pressure, it also causes the tractor protection valve to close (the air supply knob will pop out). The tractor protection valve will close automatically if air pressure is low (in the range of 20 to 45 psi). It is definitely worth memorizing the psi range the tractor protection valve will automatically close. Not only will you need to know this for the written and pre-trip exams, but you'll definitely want to know this info for real-world driving situations and when testing the air brake system. Why shouldn't you use the trailer hand valve while driving? The trailer hand valve should be used only to test the trailer brakes. Do not use it in driving because of the danger of making the trailer skid. The foot brake sends air to all the brakes on the vehicle (including the trailer(s'). There is much less danger of causing a skid or jackknife when using just the foot brake.